Hello TV lover and how is your TV life going? Today we are going to take some time to look at the currently available Dstv Nigeria packages, the number of channels and price per month. So Depending on the package you came for, you can quickly scroll down to it. 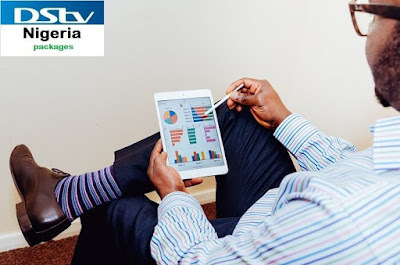 And you can also compare these Dstv packages because we will also show you the total number of channels for each Dstv Nigeria package and number of channels for major categories such as Sports, Music, Movies and entertainment, News. So depending on the number of channels for each category, you can easily decide which package you should go for the next time you try to subscribe. Analysis: This package is obviously the most interesting with a total of 185 channels. I bet only I could watch all of those at the same time, though I’m still not sure the number of televisions I would use. It’s loaded with almost everything - from fashion to sports to news, lifestyle, Wildlife, Cartoon and even church services. I really recommend using the dstv premium package on Extra View. DStv Extra View gives you the freedom of using one dstv subscription for three different decoders. With Extra View, you can use one Dstv subscription for three different rooms in a home. And you can all view different channels at once - that's the only time you will stop fighting over the remote or sometimes hiding it (for your own good). I'm not sure how much it would cost at your place but getting Extra View could cost you an extra 2200. Say you are going for the premium package, then you'll be looking at 16,900. To get more information on Extra view, visit Extra View FAQs or drop a comment below. Also with the Dstv Now app, you can have access to your favourite channels on 5 different devices at the same time with one Dstv premium subscription. Analysis: If you want a bit of everything, then go for Dstv Premium. But check out the Dstv compact Plus package: it has 11 sport channels – 4 short of the sports channels on Dstv premium. The same goes for News and commerce channels and it still has 41 – FORTY-ONE – Movie and entertainment channels with a price difference of almost N5,000: it’s 9,900 while the dstv premium is 14,700. It would also do some good if you go for Extra View when purchasing compact Plus Package. That is of course if you need Extra View. Analysis: The compact package is a few channels – about 8 – short of compact plus and it’s also 6,300 bucks while compact plus is 9,900. But it contains 11 very good channels for kids, 15 news channels including CNN, 9 on Religion and 36 Movie channels. Analysis: The Dstv family package – 3,800 a month. Considering the number of channels it has in 2 major categories, News and Local, I wonder why it’s called the Family Package. I think the package that should really be called the DStv Family is the DStv Compact. But if you love the news, you could be getting a great deal at 3,800. It has 15 News channels including CNN. It also has 9 channels on Religion and a wide range of (12) local channels. It’s also a good option for the music lovers and even the movie lovers too. Analysis: The Dstv Access Package is obviously more suitable for the news lovers. But the missing News Channels – CNN and Sky News – are yet very important channels to news lovers around the world. It still has Nat geo wild, AfricaMagic family, M-net Movies, 5 music channels and 9 channels on Religion. It seems all the packages are well fed with religious channels. Analysis: This package contains only local channels which are; NTA I, Silverbird, AIT, Channels, MiTV and Lagos TV. Obviously the children won’t be interested in this sort of package: it looks very much okay for parents who love to stay informed as Nigerians. But then is it worth 1,600 per month. Would you - seriously - pay 1,600 a month for a package with 6 (local) channels? It’s always your call. But before you go, what's your favourite Dstv Package? Drop a comment below: share what was or is your favourite package and the one you would be going for after reading this article. That's all on Dstv Nigeria Packages. Now you can easily pick up the right package for your home and office. Enjoy your TV life! Thanks for a great article. You can also visit <a href="http://alliance-tech.co.za>www.alliance-tech.co.za</a> for all DStv installation services. Hi Craig, thanks. I have something that might interest you.Read about it here here.